Windham native Jamie Harrison (right) reaches for a takedown attempt against Bruce Boyington during their NEF XVII mixed martial arts main event at the Androscoggin Bank Colisee in Lewiston, April 11, 2015. Bruce Boyington has had an interesting year in the combat sports world. He has been biding his time while the promotion to which he’s affiliated, the World Series of Fighting, is rebranding itself to the Professional Fighters’ League, which is set for a 2018 kickoff with a planned year-long tournament format unique to the sport. The 38-year-old veteran from Young’s MMA in Bangor also had a bout canceled in March, and the only fight he has had since appearing in New York City’s Madison Square Garden last New Year’s Eve was a boxing match against former New England middleweight champion Russell Lamour Jr. of Portland. That clash, held June 17 in June, ended in a no contest after both fighters suffered head cuts, with Boyington sustaining two different gashes that required three staples and eight stitches, respectively, to repair. 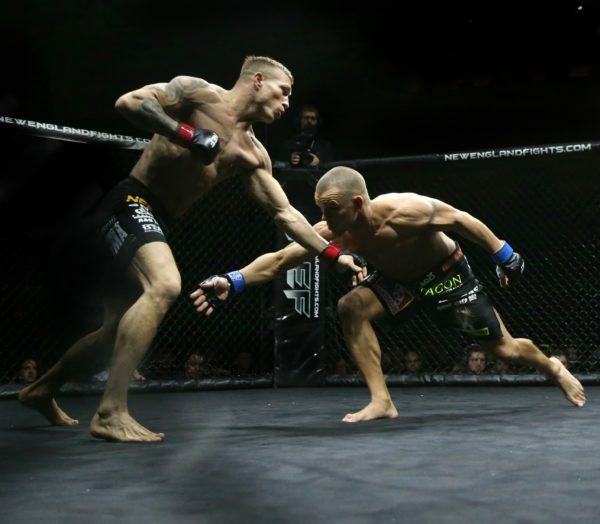 Given that backdrop, Boyington is looking forward to a return to competitive normalcy Friday night with a nationally televised fight against Nate Andrews as the co-main event of the CES 45 MMA card at the Twin River Casino in Lincoln, Rhode Island. The show will be aired on AXS-TV beginning at 9 p.m. The Rhode Island-based CES — or Classic Entertainment & Sports — is one of several MMA organizations contracted to stage shows as part of AXS-TV’s “Friday Night Fights” series, making it an attractive option for fighters from throughout the Northeast. While such other Eastern Maine fighters as Ryan Sanders, Jon Lemke and Derek Shorey have fought for CES during the last two years, this will mark Boyington’s AXS-TV debut. “I’ve been wanting to fight for CES for a long time, but I’ve been trying to stay loyal to (Maine-based New England Fights),” Boyington, who has fought on televised WSOF cards, said. The former NEF pro lightweight champion (14-10) will face a significant test in his attempt to rebound from back-to-back losses to Musa Khamanaev in Russia last August and to undefeated Andre Harrison during their WSOF 36 clash in the Theater at Madison Square Garden on Dec. 31. Andrews (10-1) has won his last four fights, most recently a third-round submission of George Sheppard as the main event of CES 40 last November. The Providence, Rhode Island, fighter, ranked first among New England lightweights by Mass-MMA.com, has scored all of his victories by knockout or submission. He has gone the distance just once in his pro career, when he lost by unanimous decision to Gemiyale Adkins at CES 25 on Aug. 8, 2014. “This is a big-league fight for me,” Boyington said. “He’s ranked No. 1 for lightweights in New England by for one of the websites (Mass-MMA.com). Saul Almeida was ranked No. 1 before when I fought him and now this guy is, and I love those challenges,” Boyington said. One of Maine’s top MMA prospects, Josh Harvey of Young’s MMA in Bangor, is expected to be sidelined for the next year after undergoing surgery to repair a torn ACL in his right knee. Harvey suffered the injury during his last fight, a first-round stoppage of Derek Shorey at NEF 28 in Lewiston on April 28. The 27-year-old Harvey, who has fought his last two bouts in the featherweight (145-pound) division, is undefeated in four fights since turning professional in April 2016. None of those victories has lasted beyond the first round. That followed two years of competing as an amateur, when he compiled a 5-1 record and won the NEF amateur lightweight title. Harvey also is a former two-time 152-pound state wrestling champion from Dexter Regional High School.